One of the joys of living in Beervana is enjoying special brews. 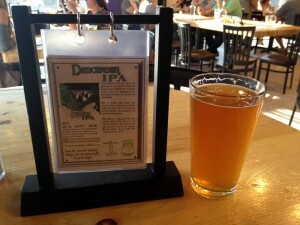 The Green Dragon Bistro & Pub hosts Green Dragon Brew Crew tapping events on Wednesdays. 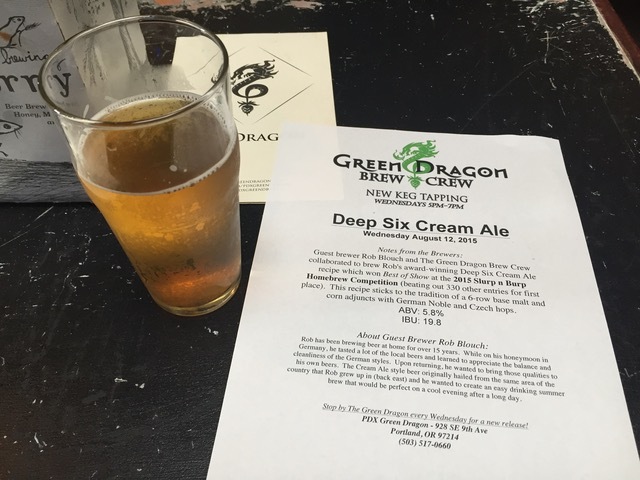 Our friend Rob Blouch brewed up a batch of his award-winning Deep Six Cream Ale and we joined him to enjoy it at Green Dragon. Rob was inspired by pre-Prohibition east coast recipes. He discovered that the 6 malt base used is being discontinued, making this a rare chance to enjoy this beer. It won best of show at the 2015 Slurp & Burp Open. The brew was refreshing with a nice hoppy bite and pleasant flavor. We enjoyed it with pub grub. 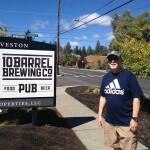 The beer will be available until the barrel is gone, so head there soon to try it. Rob was introduced and gave a short presentation about the beer. 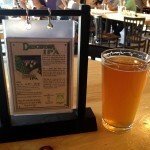 Green Dragon also has weekly “Meet the Brewer” nights on Thursdays. 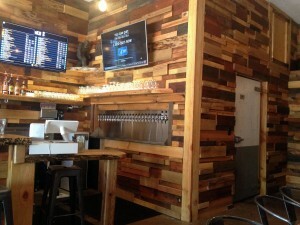 They have 56 taps of amazing beer, with always something new. 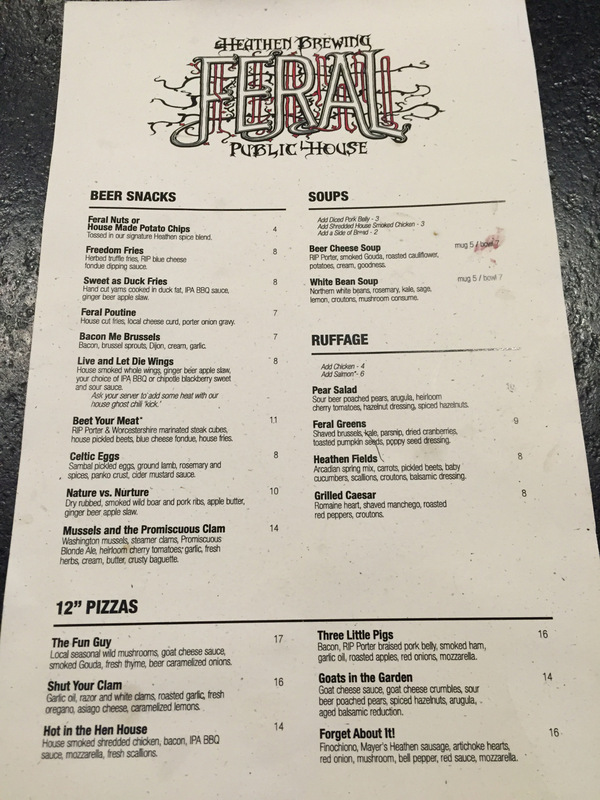 The menu boasts impressive burgers and sandwiches. 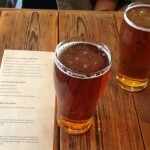 Local brews and creative cuisine – just what Vancouver needs more of so we don’t need to cross the bridge. 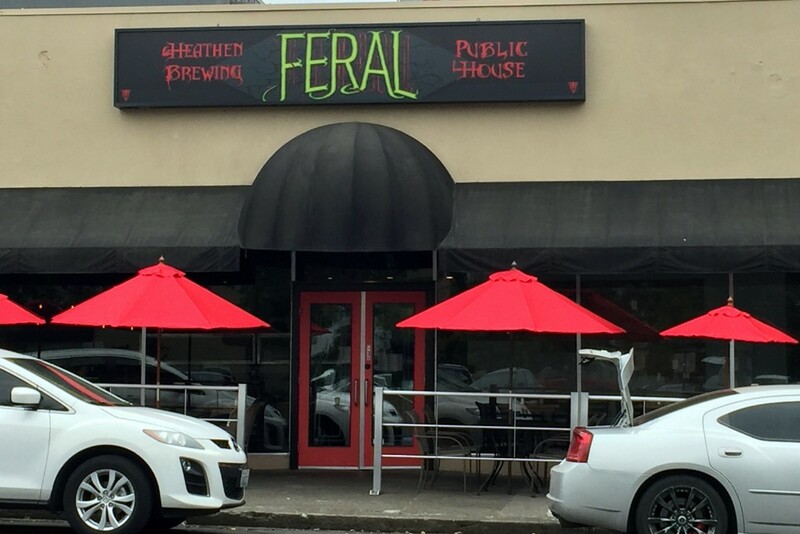 Heathen Brewing opened its Feral Public House in July, 2015. 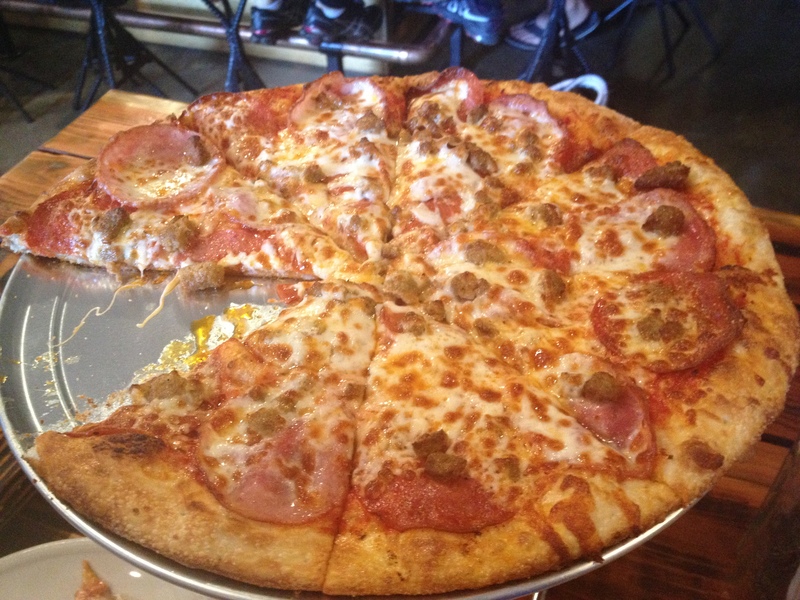 Located at 1109 Washington St, Vancouver, Washington 98660, it’s an easy turn off of I-5 at Mill Plain or a great stop for lunch (open 11:30 daily), happy hour or dinner. 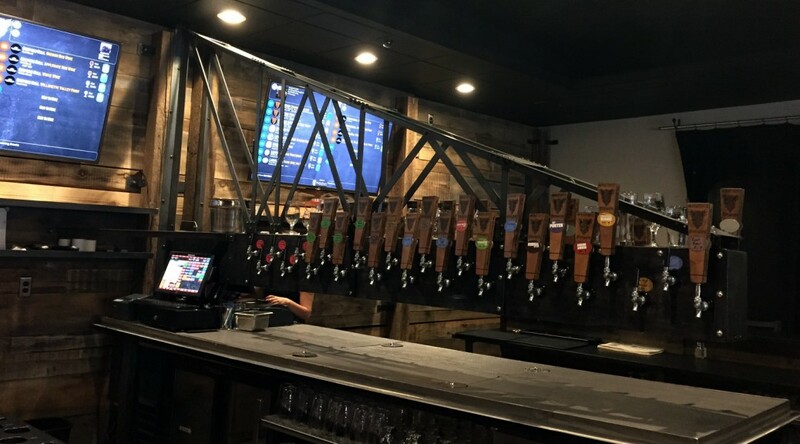 You can view the 28 taps in real time via Digital Pour. 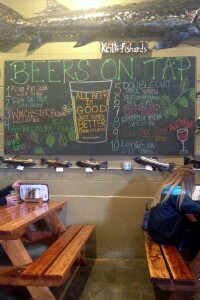 They include Heathen’s wide variety of brews, local guest taps, and Coopers Hall wine taps. 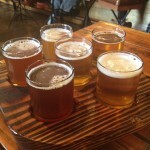 I decided to have a 5-sampler tasting pour spanning their three Belgian-inspired brews, Transcend IPA and Saison d’Ete. I was impressed by the Belgians. The samples are priced from $1.50 to $2 each. The food is provided by Chef Matt Steele, formerly of Casa Naranja and a local culinary school graduate. While they have burgers and pizza, it is definitely an upscale turn on gastropub cuisine. 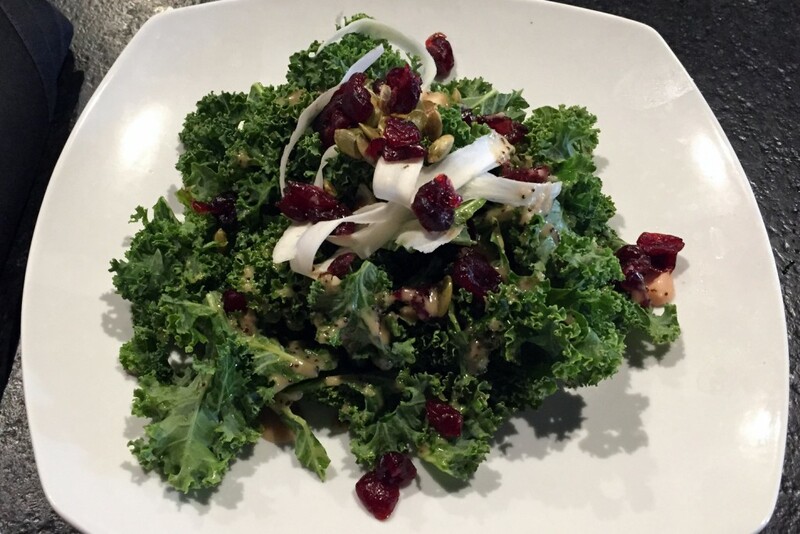 I perused the menu and spotted just the salad I wanted for my current diet – the Feral Greens includes kale, shaved brussels sprouts and parsnip, cranberries and pumpkin seeds in a poppy seed dressing. 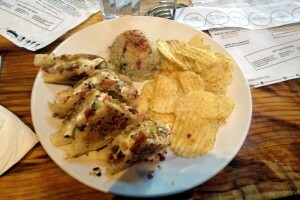 The salad was great but the beer was potent, so I ordered up the house-smoked Live and Let Die Wings – IPA BBQ variety. They were nice and smokey but would have benefited from a side of sauce. 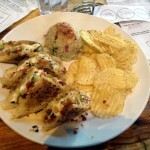 The ginger beer apple slaw they sat atop was creative and delicious. I am looking forward to returning and enjoying their other salads, Sweet as Duck yam fries, beer cheese soup, and dinner entrees. 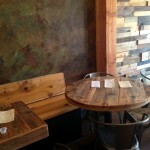 They have a variety of seating, including outside tables, inside tables and bar. It is a large and comfortable place that can host a crowd, and business has been very brisk in the evening. The restrooms were fun, labeled Feral Men and Feral Women. 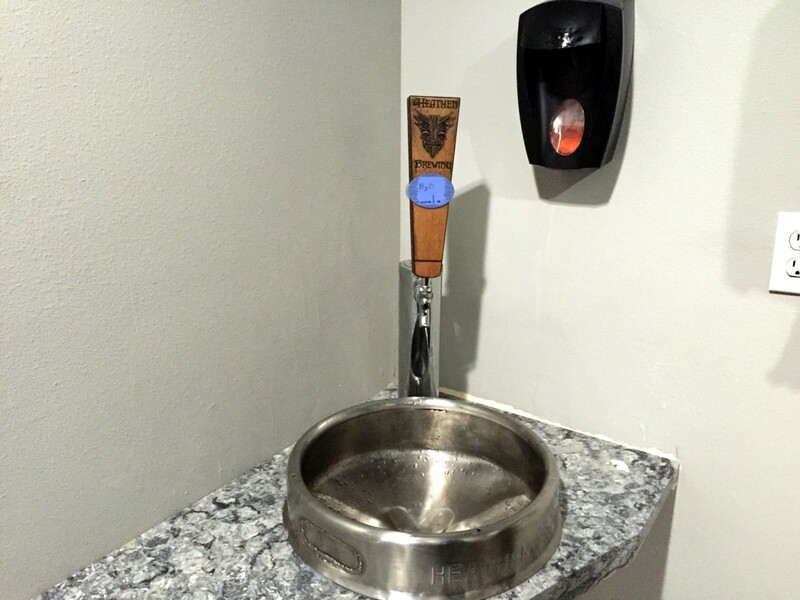 Inside, the sink faucet was a keg tap. 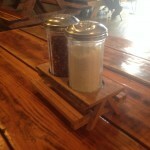 Open 11:30 am daily, closing time varies throughout the week. Brewers are setting up shop in the ‘Couve. The newest brewery, Fortside Brewing Company, is located in an industrial warehouse space on Andresen, across from a Winco. They share a signpost on Andresen, and the storefront has good signage, but it still feels a little like a speakeasy. I previously peeped in the windows of the roll-up garage door and saw a typical Northwest tap room with wood/industrial decor. 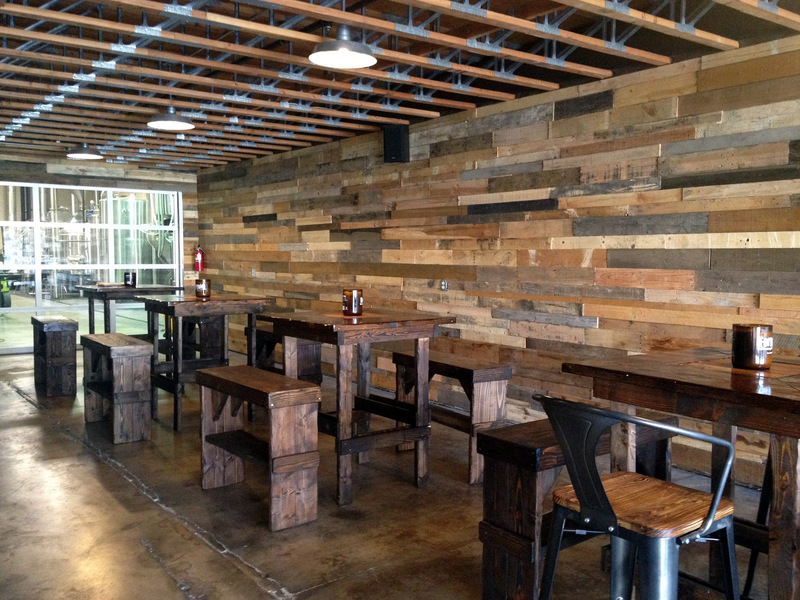 Rough wooden board paneling and custom high tables and high benches provide seating, as does a a bar. You can see the brewing equipment through the glass at the back of the taproom. They soft-opened the last week of April, 2015 and we dropped by on Thursday. They are open 4 pm – 10 pm Thursday, Friday and Saturday. 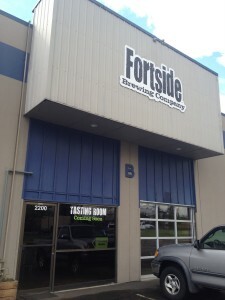 They host private events M-T-W.
As Fortside ramps up production, they were pouring just two of their beers, plus their root beer. 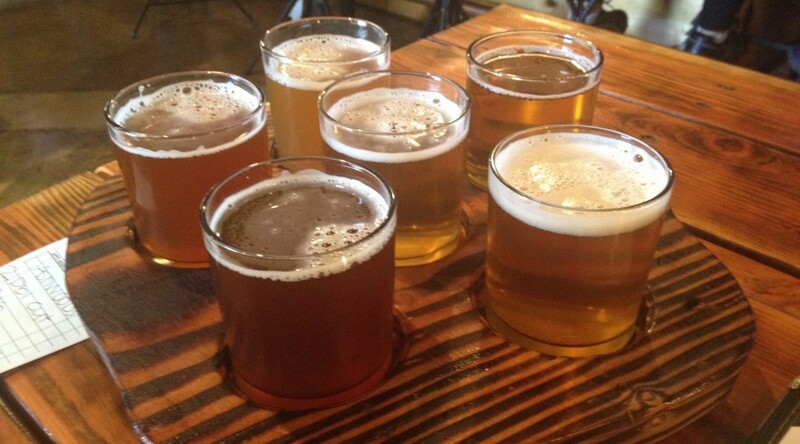 We sampled a pint of each. 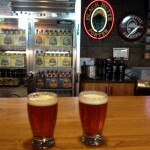 The Zythological Pale Ale pleased us, even though we are avowed IPA fans. It has a great snap from the Zythos hops. Hopunion describes these as having pineapple, citrus and pine notes. The Couve A’Licious Brown Ale was also very pleasant. 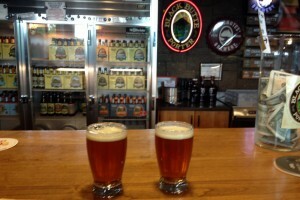 This allayed our fears that they might be close to home, but we wouldn’t care for their beer. I’d happily enjoy the Zythological Pale Ale any time. 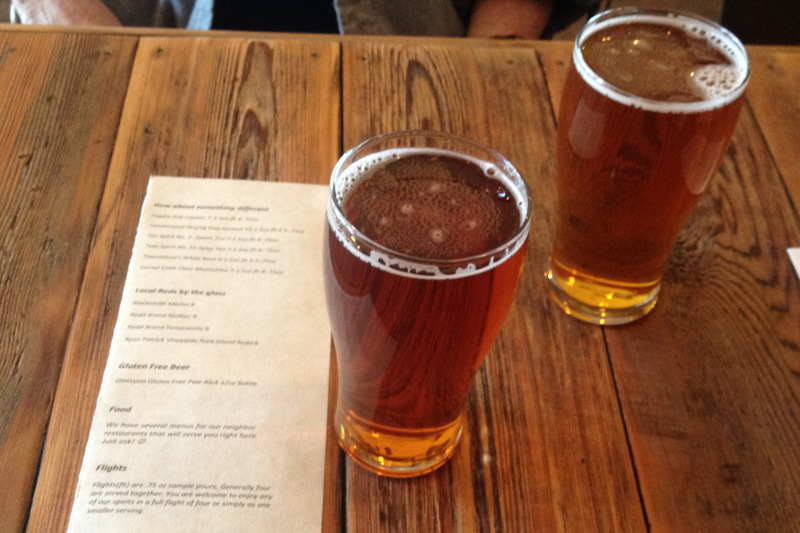 The friendly bar man also gives small tasters if you’d like to sample before getting a pint. 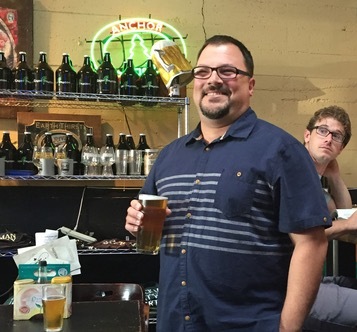 Owners Michael Difabio and Mark Doleski started as home brewers. 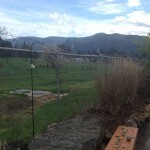 They love to experiment and will be brewing a variety of beers. It’s good that their tastes seem to match ours! 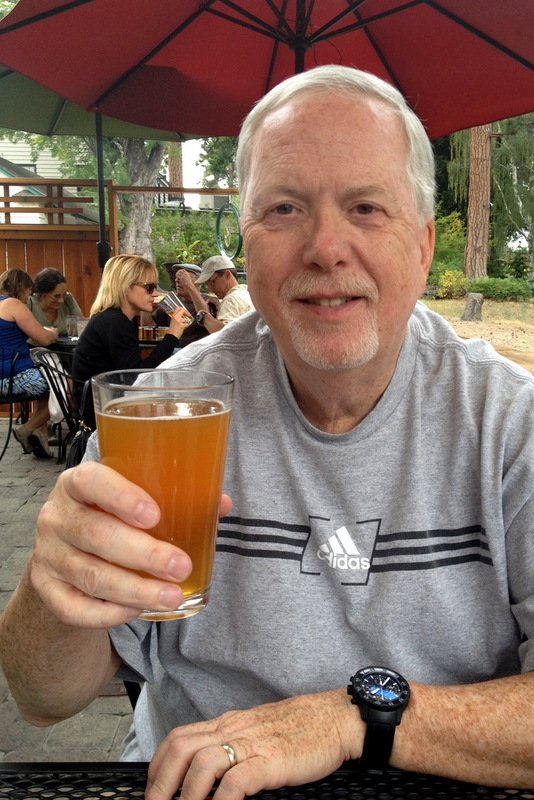 I enjoyed the small swig of root beer as well. 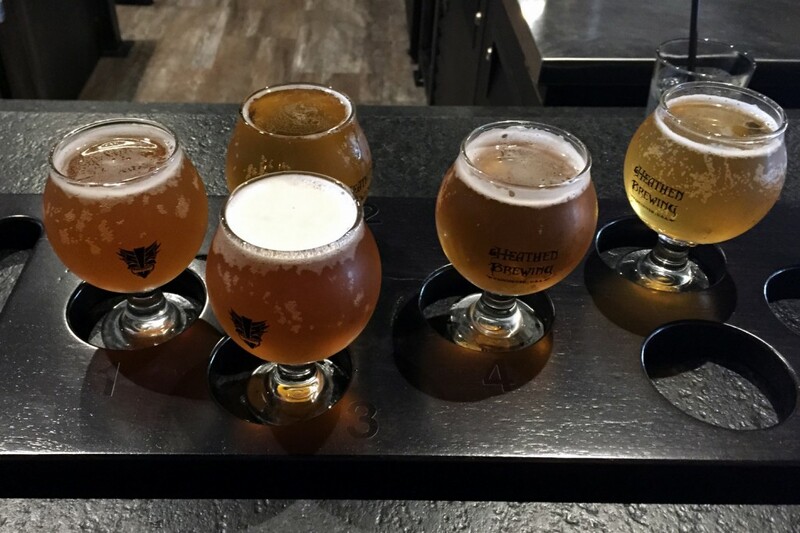 They have guest taps, which on this afternoon were Wild Ride Brew Hopperhead IPA (from Redmond, Oregon), Upright Brewing Redwing Lager (Portland) and Heathen Brewing Promiscuous Blonde (Vancouver, WA). 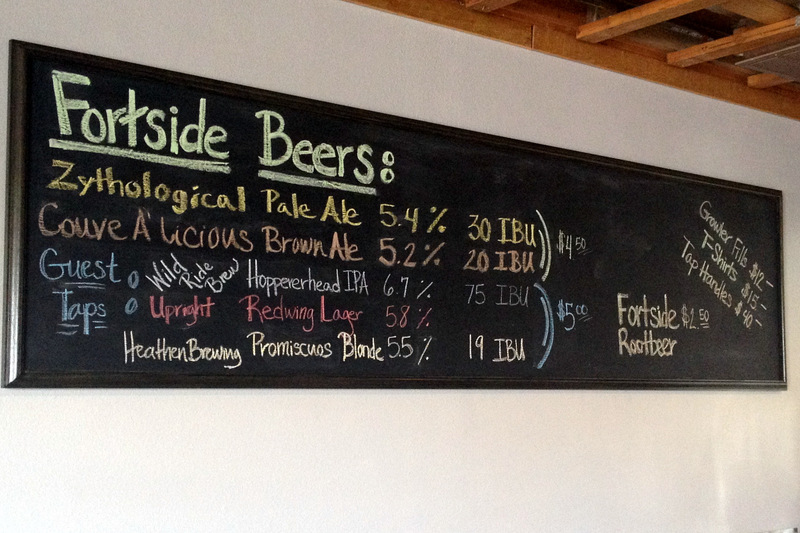 Pints cost $4.50 for Fortside, $5 for guest taps, with growlers for $12. Fortside has no food service, although they promise you can bring or order in food from nearby establishments. The tap room was comfortable and it felt like a place we could return to for an afternoon pint often. The music wasn’t loud. They plan to install some TV screens for sports. 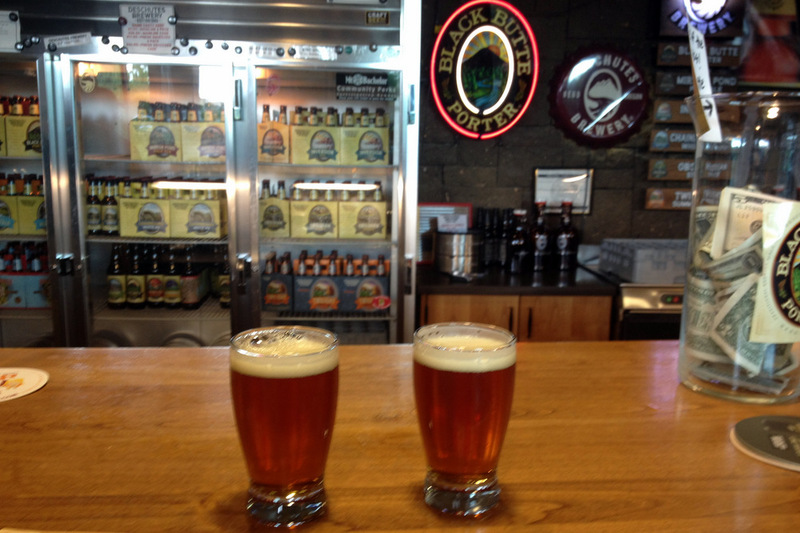 As we quaffed, more patrons arrived to sample and it looks like they are off to a good start. 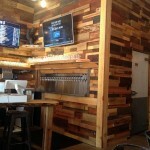 Uptown Vancouver, Washington has a new taproom and whiskey bar. 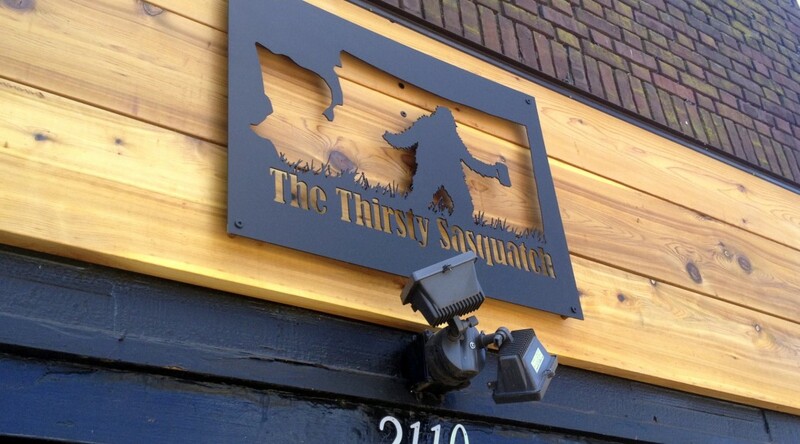 The Thirsty Sasquatch opened April 13, 2015 at 2110 Main Street. 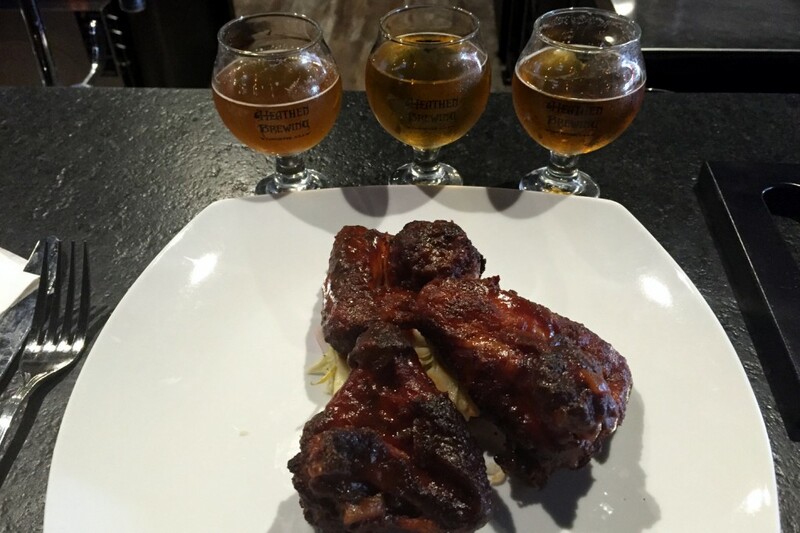 They are completely focused on craft beer and spirits from the Northwest and West Coast. The taproom has 26 taps pouring Northwest craft beer, wine, cider, kombucha and root beer. Their tap list is online and posted on a screen, complete with how much is remaining in the keg. 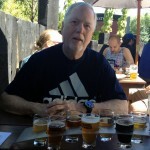 We enjoyed the variety on the list, which includes Vancouver breweries such as Loowit and Ghost Runners and Bend offerings from Crux and Boneyard. 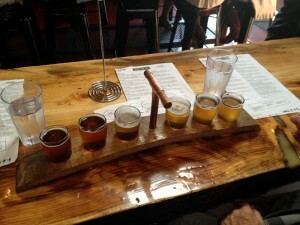 The Spirits menu offered pours from Northwest distilleries, and they offer a tasting flight of 0.75 oz. sample pours. 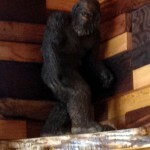 The Thirsty Sasquatch has no in-house food service, but they invite you to call their neighboring restaurants for food delivery to your table. 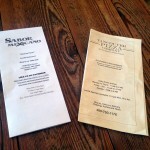 The handy menus on the table on our visit were from Sabor Mexicano and Vancouver Pizza Company. 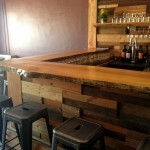 The decor is minimalist with wood paneling and custom wood benches and tables. A large mural covers one wall, and a small Sasquatch carving looks down on everyone from behind the counter. 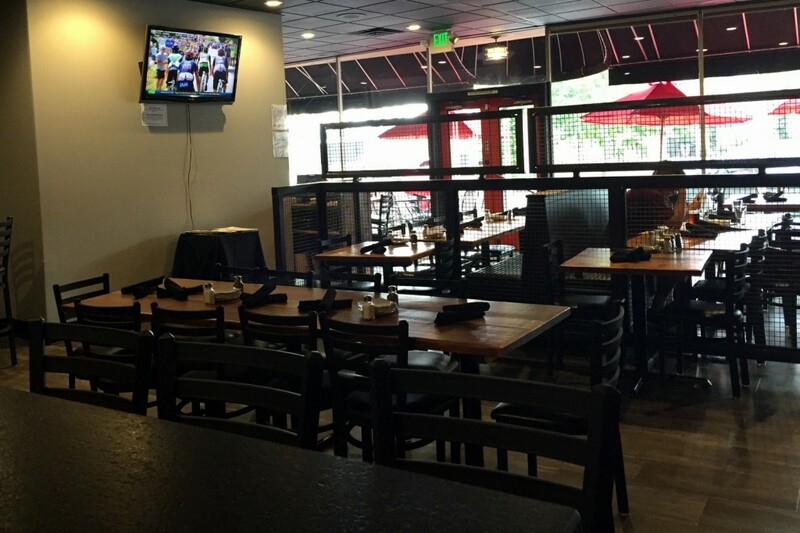 There are two booths that can seat six, 12 seats at the bar and several four-top tables with bench seating against the wall and metal chairs on the opposite side. They will open a beer garden patio soon (the concrete still needs to be poured) for outdoor seating in back. 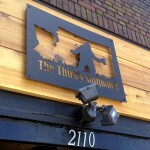 The Thirsty Sasquatch is for age 21 and over only, no underage patrons allowed. Well-behaved dogs are welcome. They are open 2 pm – 10 pm. We enjoyed our afternoon quaff of beer. It is a a pleasant no-fuss place to enjoy craft brews and spirits amongst adults. It’s easy to access the location by either car or C-Tran. 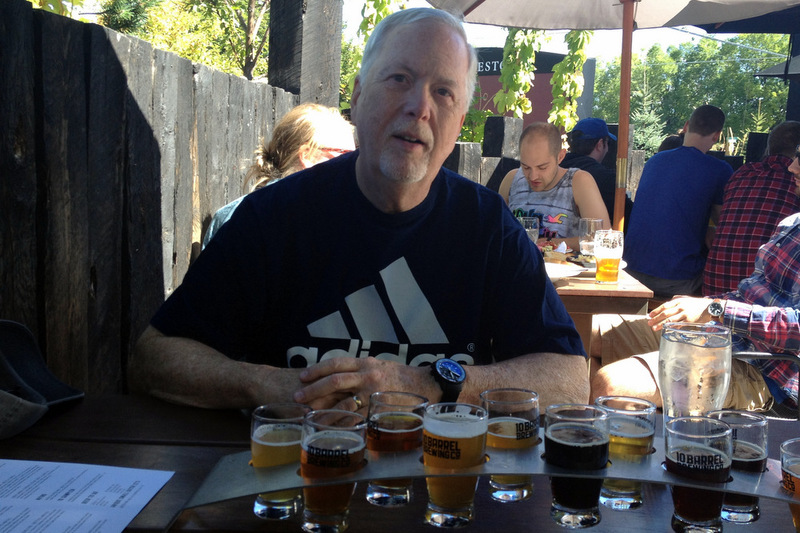 The Vancouver Brewfest always introduces us to local NW craft breweries we need to explore further. Our discovery at the Spring Brewfest was Backwoods Brewing Company from Carson, Washington. Their allotted two brews at the brewfest were their Logyard IPA (which they brew year-round and can be found in bottles and cans) and a special AshWoods IPA, a collaboration with Ashtown Brewing of Longview, WA. 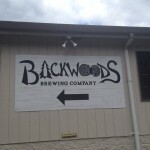 One taste of the AshWoods had both me and my husband eager for more. It had that great Citra hops citrus punch with a sweet malty body. 7.5% alcohol, 55 IBU. 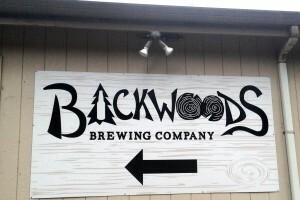 What better to do on a spring Saturday than zip down the Columbia Gorge to Carson to sample what Backwoods had to offer? 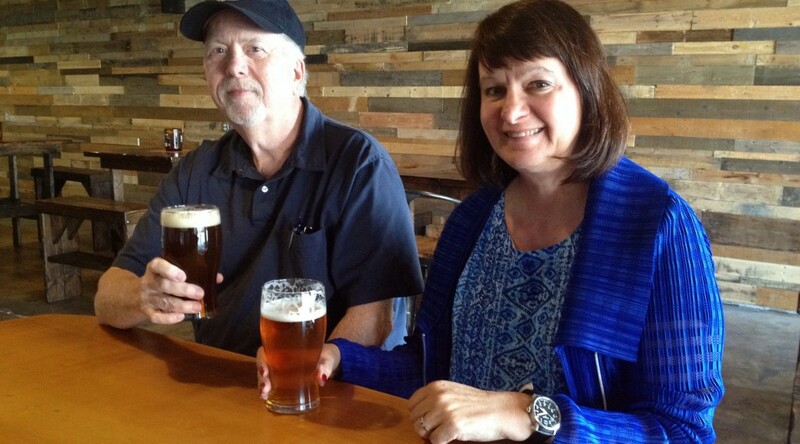 This family-owned brewery got its start in 2012. 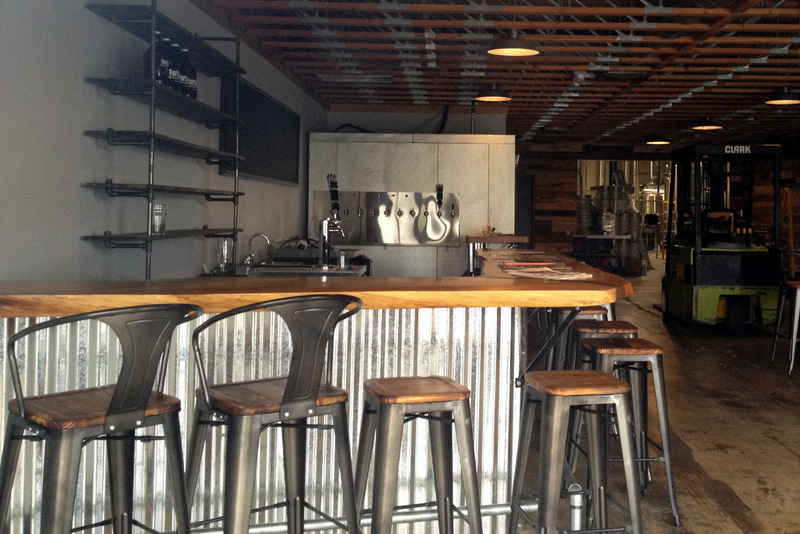 They converted the back of the general store into a rustic brewpub, open Thursday – Monday from 3 pm (at least for the winter). We arrived at 3:30 on Saturday and the tables were already full. 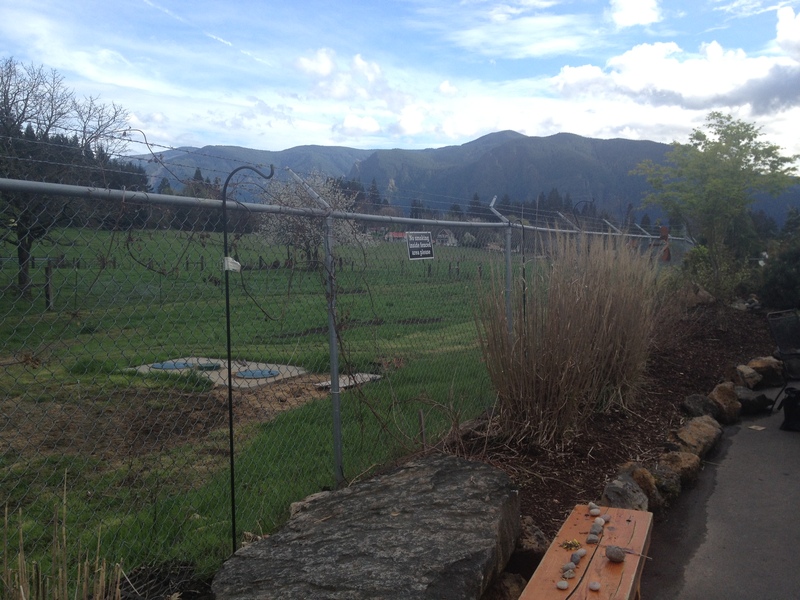 They have 12 picnic tables inside and a bar, with more picnic tables outside overlooking a pasture and mountains. The chainlink fence topped with barbed wire serves to keep the cattle away from your picnic. It looked like a great place to lounge after a fun day in the Gorge. 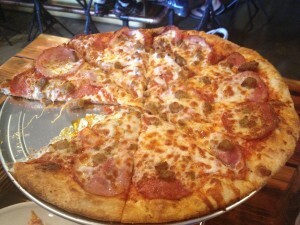 The food menu includes pizza, salads, bar snacks and grilled sandwiches. 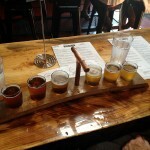 They offer a six-sample taster with generous 4+ ounce pours set into a slice of log. 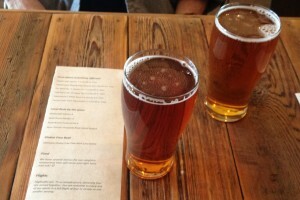 I went straight for a pint of AshWoods IPA while my husband sampled the taster. 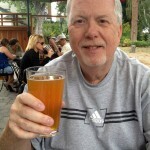 He gave top ratings to the Double Cutt IPA and AshWoods, and we both enjoy the Logyard IPA. 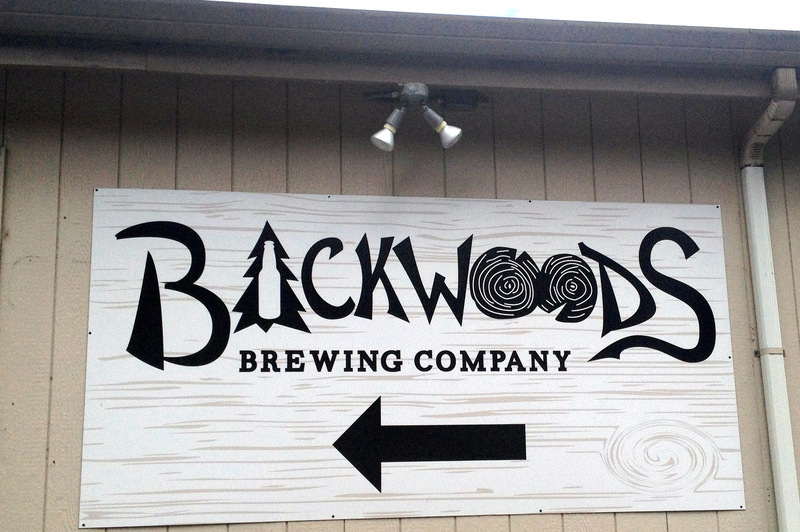 We got a growler fill of AshWoods to take home. 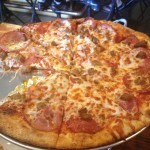 The pizza was very good, and available in three sizes. They have a list of combos that should please anyone. 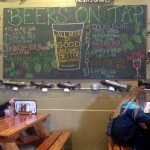 It is a place for locals as well as the tourists – loggers who love lagers and sailboarders and cyclists who love suds. It’s definitely worth setting your Garmin for to end a day in the Gorge. 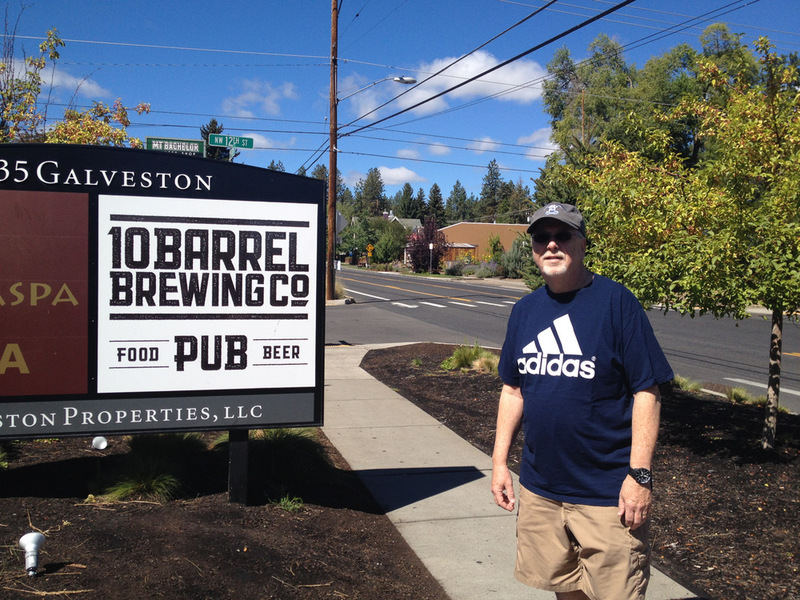 They are one of 10 on the Breweries in the Gorge Passport Tour. 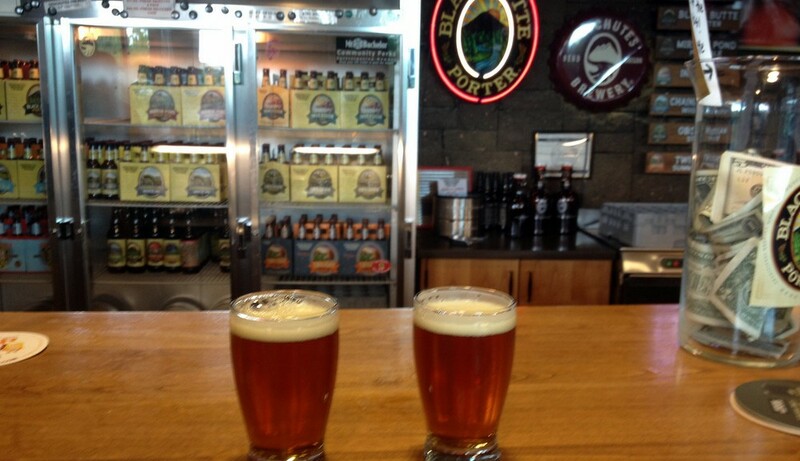 Visit 8 to get a free pint glass. 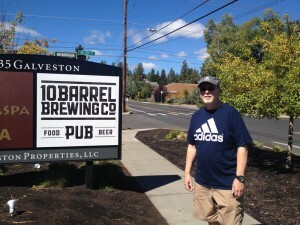 Their beer can be found on tap throughout the Northwest as well as in cans and bottles at well-stocked Northwest markets.